Fashion Week itself is a lesson in eccentricity, so labeling any one runway presentation more outlandish than the others may simply be a matter of opinion. However, each year there is a handful of designers who create such eye-widening spectacles that it seems inappropriate to place them in the same category as their less loopy counterparts — that's where lists of the craziest Fashion Week moments come in. Occasionally the presentation seems to straddle the line of legality — as did Iris van Herpen's runway when the designer sealed her models into plastic sheets with only a tube supplying their necessary oxygen supply — but most often Fashion Week productions are simply a hypnotic trip. The mass produced wares sold in international chain retailers may be designed with revenue in mind, but Fashion Week's creatives are looking at more than the financial bottom line when forging each collection. Whether designed to tell a story, unsettle the audience, or create a commentary on society, Fashion Week's runway collections are meant to create shockwaves. Out of the tens of shows to take place during Fashion Week, here are the most bizarre, insane, and occasionally terrifying Fall 2015 runways. Jeremy Scott shocked no one when he debuted yet another unconventional collection. What was somewhat revelatory was the doll-themed collection itself, which featured a pairing of adult accents with vibrantly printed shift dresses and rompers. Another Fashion Week gone, and another childhood-themed runway from Jeremy Scott. 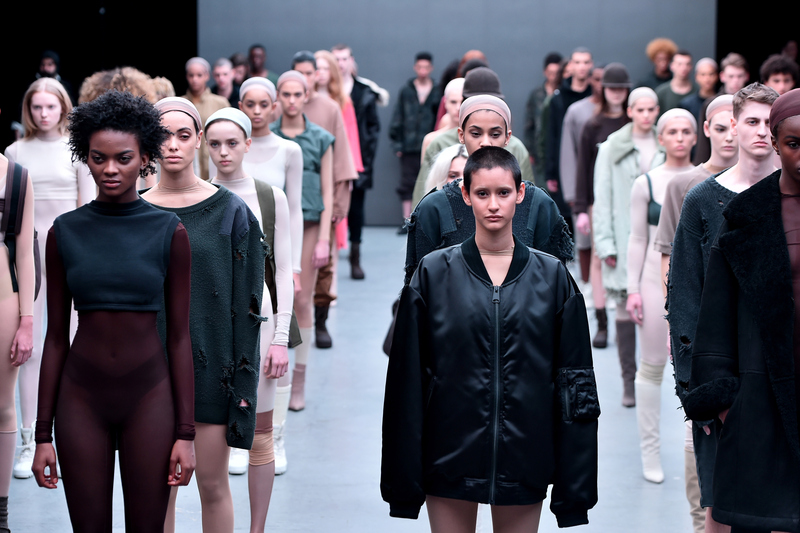 If you have any question about exactly how unnerving Kanye West's collection for Adidas Originals was for his runway audience, you need look no further than North West's tearful reaction. Between the stoic, primarily unsmiling faces of West's models and the dreadful, post-apocalyptic wares the rapper debuted on the runway, it's shocking that Anna Wintour wasn't choking back tears of horror next to North. Anna Sui unabashedly enjoys devising each of her pattern-mixed, hypnotic collections, and Sui's Fall 2015 collection certainly demonstrated her joie de vivre. Sui explained to Women's Wear Daily that her creativity was sparked by a television program binge, as all the best ideas are, and was compelled to fashion the season's cozy fur gilets and jewel-toned, patterned maxi skirts based on Vikings, a History Channel show which by all accounts is moderately addictive. Alexander Wang has never played by the sartorial rules and has reaped the rewards of his ventures, but for Fall 2015 the man who made the sweatshirt into a must-have accoutrement stepped a bit further outside the box. In addition to a deliberate, primarily black color palette for his collection, Wang also gave his models the appearance of having clawed their way out of swamp with damp, disheveled locks and pale, minimalist makeup. The leather and metal-spiked ensembles likewise gave the impression of a woman who didn't mind walk over someone in her spiked heels to reach her destination. The ever-experimental Marc Jacobs made use of a similarly inky color palette, but the designer took a more characteristically baroque approach to his collection than the more athletic wear oriented Alexander Wang. Models were given somber, chalky powdered faces and nearly black, plum lips which was further enhances by Jacobs' moody lighting, while the clothes themselves appeared both fetish-inspired and elegantly tough.